Who wants a challenge? 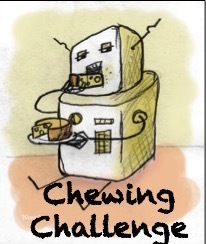 Chewing-Challenge promotes appetite-control, digestion,& pleasure! "Chew your drink and Drink your food"
What crazy person said such a statement... oh right that was Mahatma Gandhi! So this month's challenge is going to be to be in honor of the master faster himself. Instead of fasting however we will participating in a much easier challenge. Yea that sounds crazy until you start to think about it. When we drink smoothies, fruit juices, soups, we tend to just spoon or sip it in and swallow. The mental process here is that there is nothing to chew so why waste the effort. I'm here to tell you that going through the motion of chewing liquid will alert the body that digestion needs to happen. Saliva will begin to digest some of the liquid and it will prepare the rest of your digestive tract to do its magic. This is not a recommendation to make your chicken breast over spinach dinner into a smoothie. It simply means chew the food in your mouth until it liquifies. The vast majority of people chew 2 or 3 times and then swallow. Chewing at least 30-40 times per bite (depending on the food) is recommended. Let's take a look at why chewing is one of the simplest and most important things you can do to help your health. Saliva starts digesting your food. Saliva has an enzyme in it that begins breaking down starches like rice, potatoes, breads etc. Chewing breaks down big chunks of food into much smaller pieces. This is important for a few reasons. The smaller the food molecule the more surface area it will have for the digestive enzymes to interact. This digestive process is what keeps food moving safely and efficiently through out digestive tract. Not to mention as food gets digested, the nutrients and energy from food gets transferred to our body. Also, if these big chunks of food do not get broken down they will pass through to the lower parts of our digestive tract and bacteria will try to break them down for us. When we rely on bacteria to digest our food the by product can contribute to gas, diarrhea, bloating, constipation and other unpleasant symptoms. Chewing promotes weight loss and portion control. How nice would it be if your body actually helped you lose weight? Well, it can! It takes your body at least 20 minutes to register that it is full. Chewing slows down the eating process allowing your body to tell you to stop eating when it is satiated. You will no longer need will power alone to curb your overeating, your body will tell you to put down the fork. Truly savoring our food. Too often we eat so fast we lose out on enjoying the smells, the texture, and the variety of flavors our food has to offer. So the challenge: Be aware of your chewing and try to chew at least 20 times before swallowing. Try this for a week and see what you notice. Let me know how it goes at drkiradc@gmail.com.